Whip up a batch of these simple confections to serve your coconut- loving Valentine. Line an 8 or 9 inch square baking pan with parchment or waxed paper. In a large bowl, combine milk, and confectioner's sugar. Stir in coconut. Mix until well combined, and a stiff mixture is achieved. Divide mixture in half. Press half of mixture into lined baking pan. Gently roll a drinking glass back and forth to smooth it out. Gently knead in a few drops of food coloring to the second half of mixture. Press it on top of first layer. Roll again with drinking glass. Cover well and chill. After several hours or overnight, cut into 3/4 to 1 inch squares. Thanks for sharing this. I plan on giving it a try as I have coconut left over from our Christmas cookies. I was thinking of macaroons--but this looks easier. Yum! 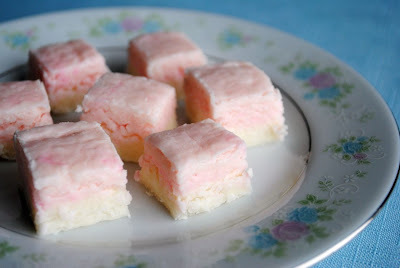 I have to try these... they look so girlie and delicate! thank you for this recipe! my friend gave me a measuring cup set that had the american units for christmas. i'm gona inaugurate it with this recipe and give the delicacies to her. looks yummy! I removed these from the pan before cutting them, as the pan was lined with parchment. Hearts would be cute, but you'd have to use a VERY tiny one, as they are very sweet. I just finished making some of this and I think I done a pretty good job. Thanks for sharing.